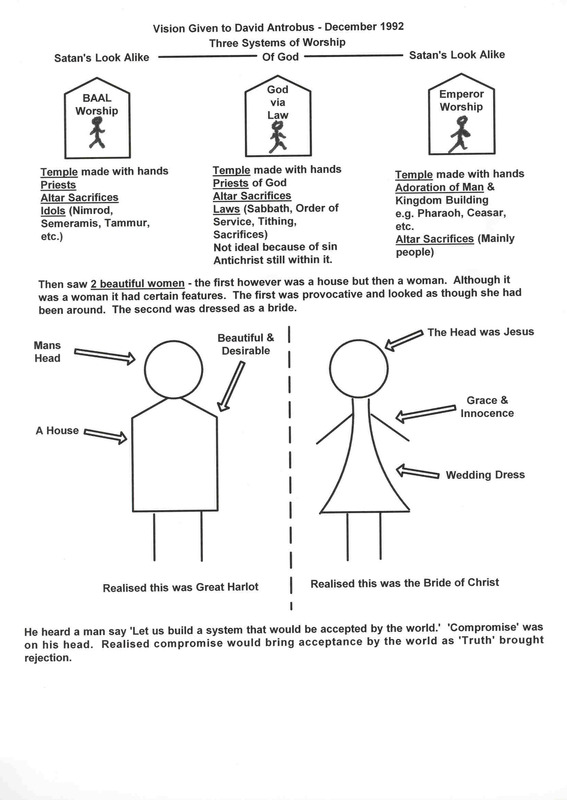 David Antrobus (is a brother who) lives in England and was given, in December 1992, this vision and revelation regarding the fact that the Harlot and Bride were beginning to separate, having been mixed up together to that point. Those with whom David first shared this vision and revelation found themselves dramatically experiencing this separation within days and began to realise they had recently already undergone its beginning. Nothing has quite been the same since this time amongst that which we might call 'church' for this vision and revelation is a 'word' for us all. When David first shared this he used three, hand drawn, diagrams to enable the vision and revelation to be better understood. Notes from those three original diagrams have now been translated into the format shown here and on the next two pages.